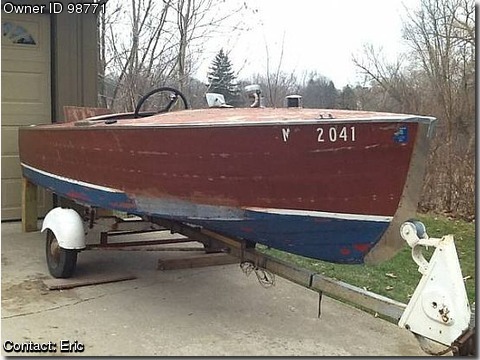 Boat is located in Commerce Township,Michiga.Please contact the owner @ 248-613-two zero two three or eric9230(at)att(dot)net…This runabout is 15 1/2 feet long &amp; it is a Model 17 with a straight four Model B engine. This original &amp; almost complete runabout was intended to be restored but it has sat in my garage instead. The boat is titled/registered in my name and I have documentation from The Chris Craft Archives at The Mariner&#39;s Museum in Virginia verifying the year/model. Time is moving on so here&#39;s an excellent chance for someone else&#39;s project. The carb was rebuilt and the engine started almost immediately. The engine runs strong but would need a valve job to get it perfect. The transmission did not have any problems. The body all around is solid. The trailer came with the boat &amp; it is included when sold. If interested please call me at 248-six-one-three-2023.